The dataset used for TREC 2017 Dynamic Domain Track consists of two domains: Ebola and New York Times. The Ebola dataset is crawled by Juliana Friere (NYU, juliana dot freire at nyu dot edu), Kien Pham(NYU), Peter Landwehr (Giant Oak, peter dot landwehr at giantoak dot com) and Lewis McGibbney (JPL, Lewis dot J dot Mcgibbney at jpl dor nasa dot gov). The Ebola dataset contains records related to the Ebola outbreak in Africa in 2014-2015. The original dataset includes tweets relating to the outbreak, web pages from sites hosted in the affected countries as well as PDF documents from websites such as World Health Organization, Financial Tracking Service and The World Bank. Such information resources are designed to provide information to citizens and aid workers on the ground. The New York Times dataset is published by Evan Sandhaus in 2008 under LDC Catalog No. LDC2008T19. The New York Times dataset consists of articles published in New York Times from January 1, 1987 to June 19, 2007 with metadata provided by the New York Times Newsroom, the New York Times Indexing Service and the online production staff at nytimes.com. Most articles are manually summarized and tagged by professional staffs. The original form of this dataset is in News Industry Text Format (NITF). This dataset can aid the research in Document Categorization, Information Retrieval, Entity Extraction and etc. The details of these two datasets are shown in Table 1. All the released data will be in TRECTEXT format. The document_number is a globally unique id across all the datasets. The original_content is the document content in the original format. That is, if the document is from Ebola dataset, then its original_content is usually in html format (sample) ; if the document is from New York Times dataset, then its original_content is in NITF (sample). This section provides instructions about gaining the access to the corpus data. For topics, you will need to obtain it from TREC(NIST). To get access to the collections, you must be a TREC 2017 participant. Complete the TREC DD Organizational User Agreement (password protected, use the TREC participant password) and email it as a scanned PDF or a high-quality digital photo to Angela (dot) Ellis (at) NIST (dot) gov, including your TREC participant ID. Within a week you should receive access credentials to download the data. Local users of the data must complete the Individual User Agreement and return it to the organizational point of contact who will maintain those records. 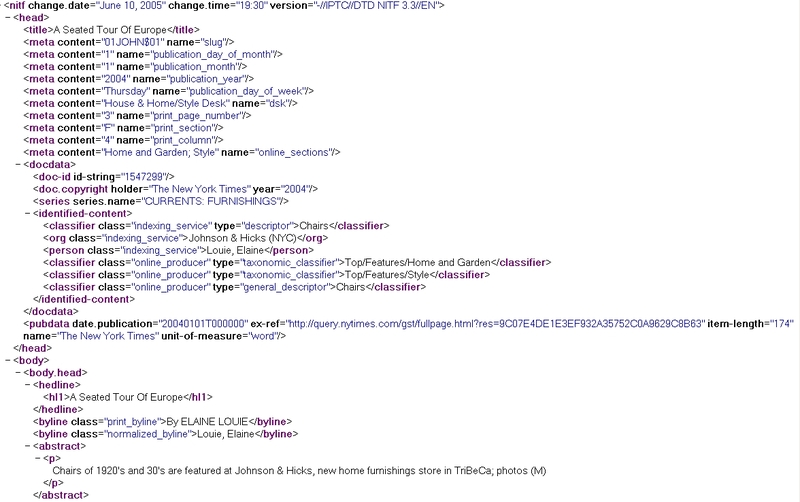 You can only get access to the New York Times dataset through LDC. Most universities and research institutions hold a LDC license. You may want to contact your own institution first regarding the access first. Besides that, we also provide scripts (enclosed in Jig) uncompress and transform the format of the original file, which may help you build your own index. This page is owned by TREC Dynamic Domain Track Group.